Father’s been dead 13 years now and that still is one of my first thoughts on my birthday. I don’t clearly understand this strange duality that goes on in my head. There is the realization that another year has gone by, and with that, the whole long list of things I had hoped to do but haven’t done. About mid-day I was able to kick my brain into a better space and appreciate the fact that I am still alive. I will admit that just after I received my diagnosis of cancer, I had a few dark weeks wondering if I’d make it this far. Well, I have made it and now am in danger of living long enough to force my grand kids to pick my nursing home. Life is good. You’ll remember that a couple of weeks ago I listed some of the things I’d like to do this year. 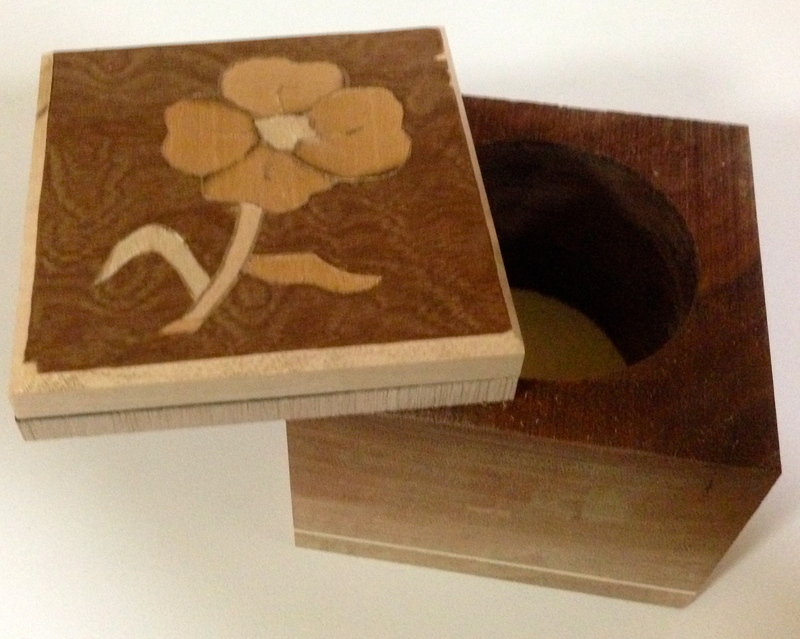 Two were to do more marquetry and to sell a piece of my work. 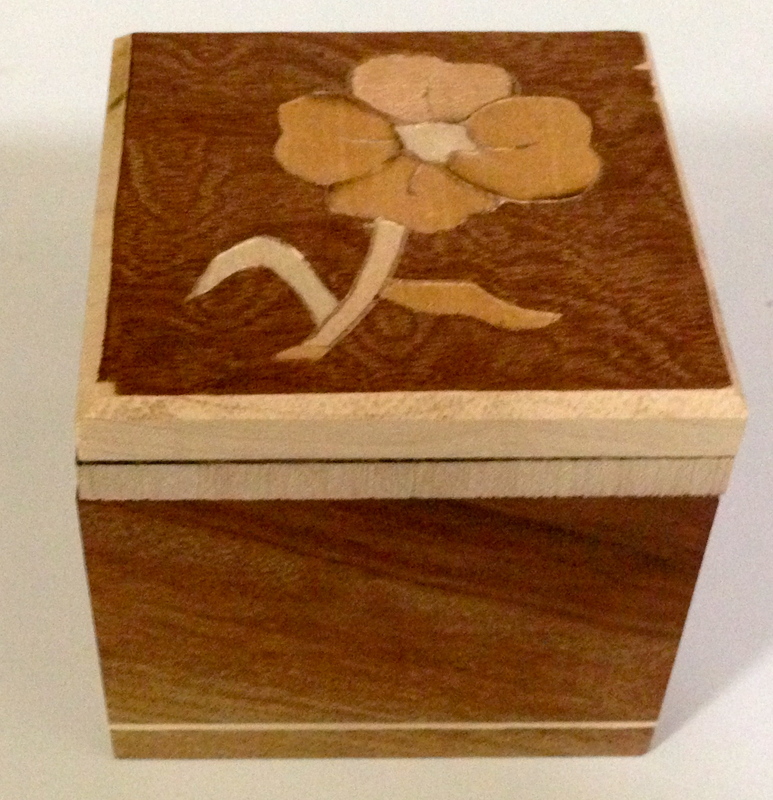 Well, I did do a piece of marquetry last month for another box I am building. No pictures of that today as it’s not ready to be seen by the world just yet. I have a number of unfinished pieces that I plan to get completed soon. I have one special piece that I plan to start working on that I want to tell you about. It will be a piece that I will be offering for sale with the proceeds going to my church. It’s a bit of a story so sit back and listen. 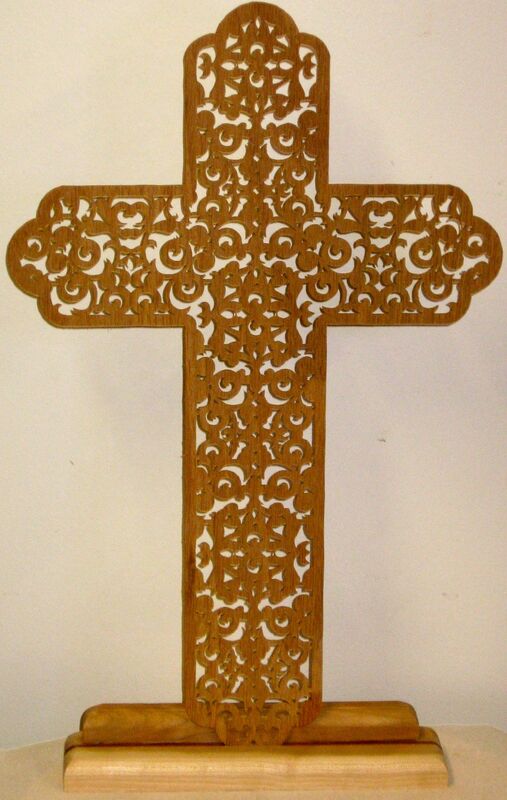 Long time readers of this blog will remember the fretwork cross I made two years ago, just after I finished radiation treatments. I made three altogether. One I gave to a grandson and the other two are still in my house as I haven’t decided what to do with them. I found the process of cutting this cross to be meditative and really helped focus my mind on something outside the problems my body was going through. I’ve wanted to make another cross but haven’t made the time. Well, I now have a motivation to make another one. At our church there was this large and very old silver maple tree. For a few years we’d been told that it was getting near its end of life and would need to be cut down. It had been a fixture there for some 50 years and no one was rushing to take out the chainsaw. Last summer the tree finally succumbed to its age and a major limb fell off. We were fortunate that no one was under the tree at the time since the limb that fell likely weighed at least a ton. That required the church to call out the tree crew and have the tree removed. It was a sad loss of an old friend. Our church has a number of very creative people, including a number of woodworkers. Our resident wood turner, Jim, brought in members of his wood-turning club and they salvaged a large amount of wood from the old tree. They took it away to dry and mill with the idea that we’d make stuff out of the wood for the church. I did ask for some of the wood with the thought of making one cross from it. Jim milled a number of pieces for me and they are now sitting in my shop. They are now dry enough to cut and my work begins. My thought was to make this project my Lenten project but Ash Wednesday is late this year, March 5th and I don’t think I want to wait that long to get started so next time I get into the shop I’ll start the long process of turning this raw wood into a fancy cross. I’ll keep you posted on my progress – likely I’ll still be working on the thing when lent starts, but hope to finish before Easter. When the cross is finished I am hoping to sell it at church along with some of the bowls and other things that are being made from the wood of our old tree. Perhaps it will make a little money and I’ll have the satisfaction of having sold a piece of my art. But just as likely, I’ll find the work itself to be the most rewarding. It just amazes my mind that raw wood, fallen and salvaged can be turned into a beautiful work of art. This entry was posted in General, Marquetry, Prostate Cancer, woodworking and tagged birthday, Marquetry, Prostate Cancer, scrow saw, woodworking, woodworking. Bookmark the permalink. Happy Belated Birthday. We’re working on finishing our home to see this year. Been working on it since 1999. Thanksgiving, gutted the master bath room (only 5ft X 8ft, shower). Installing new shower and floor tile, commode and vanity top. Thinking about selling off all my carpenter shop tools. This week, my son in laws father is buying my ShopSmith. Wanting to move close to our kids who lives in Olive Branch, MS (we’re in Bartlett, TN). We’ve got some big projects coming on our house. Mostly the roof and electrical. You will help make that poor old tree a two-fold blessing! Good luck in selling it, keep us informed. I know how long it takes to grow a tree and I just hate to see the whole thing thrown in the chipper to make mulch. It’s much better to use what we can. There will be progress pictures. Happy Birthday!!!!! The tree is dead—-you’re alive—-pretty cool. I have only been following your story for a short while so I don’t know about all the things you craft from wood. I’m into guitars—-thought I would grow up to be a rock star and all of that stuff—didn’t work–but I have built a few guitars. Have you thought about guitar necks? Solid maple? Might be a good seller. If you research and decide that this is a good idea I will buy the first Telecaster style neck you make—–as long as it comes from the tree at your church–then I will help you sell others that you make—although you probably won’t need any help. Hang in there Andrew—–and keep writing. Ron – well, we don’t have any luthiers in our number so I’ll admit that guitar necks hasn’t crossed our minds. I do marquetry and scroll saw work, plus the odd bit of cabinetry. We have another group that is most wood turners. But now that you mention it, I’ll have to go back and check our drying racks and see if we have anything would make a guitar neck. Interesting thought. Thanks.